Jonathan, who was the 14th president of Nigeria, turns 60 tomorrow November 20, 2017. 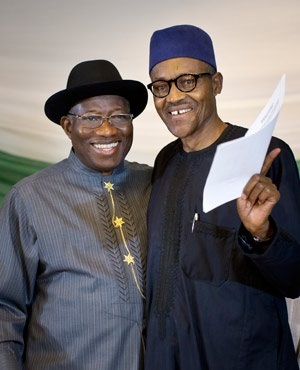 President Mohammadu Buhari is celebrating his predecessor Goodluck Jonathan, who turns 60 on Monday. Buhari noted that the former president, within a short period rose from being a Deputy Governor, Governor, Vice President to becoming Nigeria’s President for six years. Speaking through his Special Adviser on Media and Publicity, Femi Adesina, Buhari added that Jonathan’s foray into politics and ascendency to the highest political office in Nigeria from a humble riverine background testifies to the greatness and inclusiveness of Nigeria’s democracy, and serves as an invitation to all those with interest to add value to the nation. Jonathan, who was the 14th president of Nigeria, turns 60 on November 20, 2017. On May 29, 1999, Jonathan became deputy governor of Diepreye Alamieyeseigha after winning the Bayelsa State gubernatorial election. On December 9, 2005, Jonathan was sworn in as Governor of Bayelsa State upon the impeachment of Alamieyeseigha by the Bayelsa State Assembly. On 29 May 2007, he became Nigeria's vice president under Umaru Yar'Adua administration and served in the position till 5 May 2010. On 9 February 2010, a motion from the Nigerian Senate invested Goodluck Jonathan as acting President of the Federation because President Yar'Adua went to Saudi Arabia in November 2009 for medical treatment. Following the announcement of Yar'Adua's death on 5 May 2010, Jonathan was sworn in the next day as president of Nigeria. He went on to contest the 2011 presidential election and won. In April 2015, he was ousted after one term in office by current president Buhari.